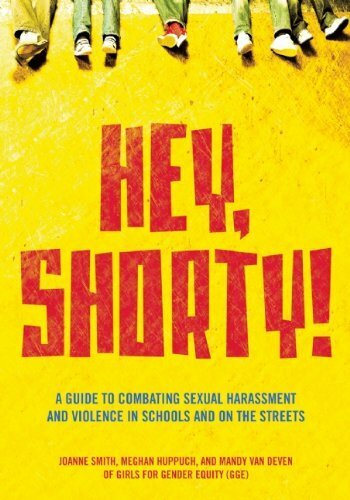 I’m rarely as inspired by a book as I am by Hey Shorty: A Guide to Combating Sexual Harassment (http://www.feministpress.org/books/girls-gender-equity-gge/hey-shorty), so I had to write you about it. It’s about a group of New York City high school students fighting harassment in their schools and on the streets, and trying to get the Department of Education to pay attention (links to events and publicity details in bold at the bottom of this email). Harassment is so pervasive that it’s tough to tackle, but these girls were undaunted. I hope you will consider helping them share their story. Schools are supposed to be safe spaces for learning, but it doesn’t always work out that way. For many girls and LGBTQ youth in New York City, sexual harassment inside and outside schools makes sidewalks, hallways, playgrounds and stairwells intimidating. This past Friday, I met with a group of teen girls at the Lower East Side Girls Club, and I heard harrowing stories of harassment by their peers and older men, some of whom loiter outside schools waiting for children to emerge. Several of the girls I spoke with had been followed home or physically grabbed by men or boys. These girls’ work is a potent example of youth activism: they successfully raised awareness about an issue that has too often gone ignored. The girls surveyed thousands of their fellow students around the city about sexual harassment. According to their research, “sexual teasing, ogling and touching is ubiquitous enough that [students] think these types of behavior are a normal part of everyday school experience.” In collaboration with the Malcolm X Grassroots Movement, the girls made a documentary about harassment (trailer here: http://www.youtube.com/watch?v=Ls-WsoD0gJA ). The young women and the Girls for Gender Equity team tried to get the Department of Education to do something about it, because, it turns out, the D.O.E. is legally required to. I’d always heard about 1972’s Title IX in the context of athletics (thanks to Patsy Mink of Hawaii— first woman of color in Congress— for authoring the legislation), but it also protects students against sexual harassment. Read this book and you will feel the group’s frustration at finding out that in New York, Title IX coordinators—required by law— are M.I.A.. In my own research on street harassment ( http://blogs.impre.com/latin_nation/2010/09/13/the-uncomfortable-walk-home/ ) I’ve been struck by how often it affects young girls on their way to school— city councilmember Julissa Ferreras, who organized the country’s first ever hearing on street harassment of women and girls last October, heard from girls in her district who were being explicitly harassed as they walked past a construction site on their way to class:http://stopstreetharassment.com/ending/NYCHearingOct2010.htm. But despite all that attention to what happens on the sidewalk, I didn’t know much about what happens once girls arrive at school. According to Hey Shorty, school is no sanctuary. We need to take action to make the streets and schools safer for our girls (and everyone else). Hey Shorty offers a detailed blueprint for how to do it, by empowering young people to take leadership on this issue and supporting them to develop effective strategies. But as you’ll see, despite all their hard work, these young women and their allies were not able to make the D.O.E. enforce policies that exist to protect students. We must raise awareness of this issue, and of the leadership these young women have taken, so next time the D.O.E. can’t ignore them as easily. These girls had incredible successes, but they can’t do it alone. Order a copy: it’s just $8.37 here: http://www.feministpress.org/books/girls-gender-equity-gge/hey-shorty. Buy one in person: I’m speaking at an event in Brooklyn, tomorrow night, and GGE founder Joanne Smith will be there selling books: http://www.facebook.com/event.php?eid=186759621366423. These girls know what to do, but they need our support. This would be great to pair with Dude, You’re a Fag, which we assign in Intro to LGBTQ Studies (and which I also used when I taught soc of gender). I am putting this on my To Read list. This looks fabulous.